Infielder Paul Goldschmidt #44 of the Arizona Diamondbacks makes a diving catch during the sixth inning of the MLB game against the Los Angeles Dodgers at Chase Field on April 11, 2014 in Phoenix, Arizona. St. Louis Cardinals gave up a right-handed pitcher, a catcher, an infielder and a draft pick. 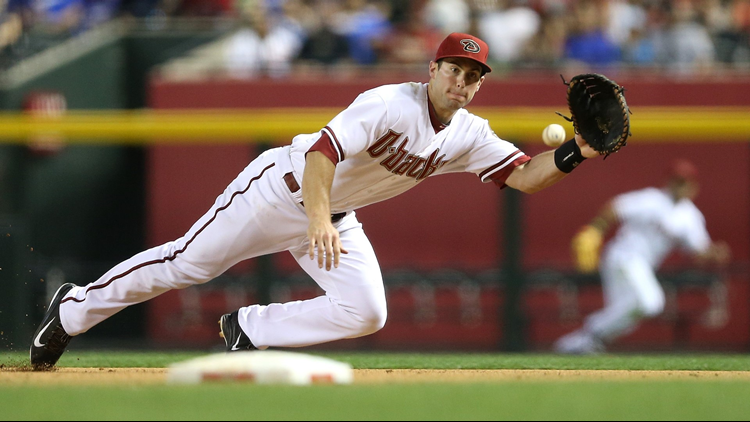 Diamondback fans may not want to hear this, but, Goldy’s time in Arizona is over. The D-backs announced Wednesday they traded Goldy to the St. Louis Cardinals for right-handed pitcher Luke Weaver, catcher Carson Kelly, infielder Andrew Young and a 2019 Competitive Balance Round B draft pick. The first baseman was about to enter the final year of his contract owed $14.5 million for 2019. As for Diamondback fans, you’ll have to wait until Sept. 23, 24 and 25 when the Cardinals come to Chase Field to say goodbye to Goldy. Pitcher Luke Weaver was 7-11 with a 4.95 ERA for the Cardinals in 2018. Catcher Carson Kelly, 24, was ranked by Baseball Prospectus as a Top 7 catcher in 2017-18 at Triple-A and has been worth +22.1 runs defensively, third-most in Triple-A.